Maybe I was a little hard on myself yesterday. Maybe I haven't given Finn enough time to settle in. Maybe I'm completely overwhelmed with new barn/routine. Maybe. Brought Finn in this AM. Me and Carole talked and decided that Finn and Jake cannot be the only horses in that paddock. They are much too attached. They should be moving to a bigger paddock in a few days with possibly two other horses. Finn was a mess on the cross ties. New barn is scarily spotless at all times. While I was picking Finn's hooves, one of the barn worker's was already underneath us with a broom sweeping up! I'm definitely not used to a barn being this clean and organized. 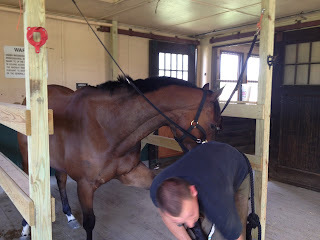 Finn was a nut on the cross ties, and because the barn was pretty quiet, I decided to lunge him in the indoor. He was pretty crazy and not listening at all. Decided to let him off the lunge and let him run around the indoor. 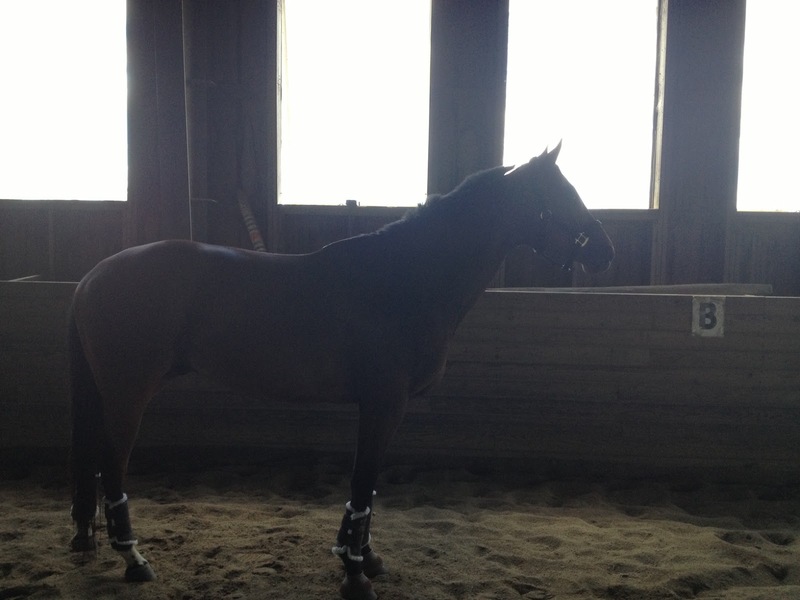 He cantered around for a good 30 minutes... And wasn't even sweaty after. It also wasn't a crazed/nervous canter, and minus a few squeals and bucks he was really just getting energy out. After he explored everything in the indoor he was an angel. I think he is so distracted by the horses in the paddocks next to him and the grass, that he's not doing his usual canter/gallop around the paddock and saves his craziness for me when I bring him in. Didn't have time to ride, as the farrier showed up. Finn was a jerk for the farrier and completely distracted by the horses outside. It took him nearly 2 hours to get new shoes. Luckily his farrier is a saint and was so patient with him. I will hopefully get a ride in tomorrow night. If not I am off on Friday and will be riding Friday and Saturday. Michelle is coming up on Sunday to ride him too, so he'll get some quality schooling in him again. I was so upset yesterday and thinking about it was all just a series of events outside our control. And I did not handle it correctly. I just know our next ride together will be better. I think this is the best conformation shot I've gotten of Finn ever. I think he looks great! The next ride will be better, don't worry! It took longer or Simon to settle in from our move than I thought it would.